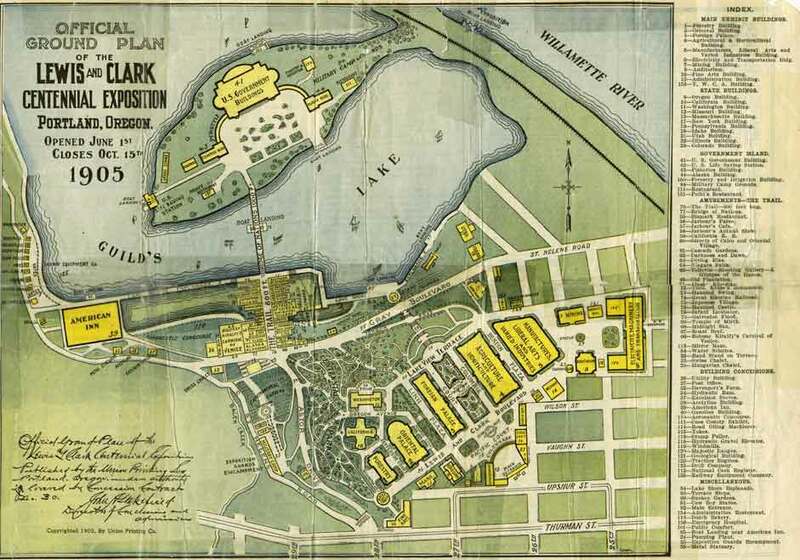 The official map of the LCCE shows the location of the Washington Pavilion, below-the-center, from which the historical view was most likely taken. 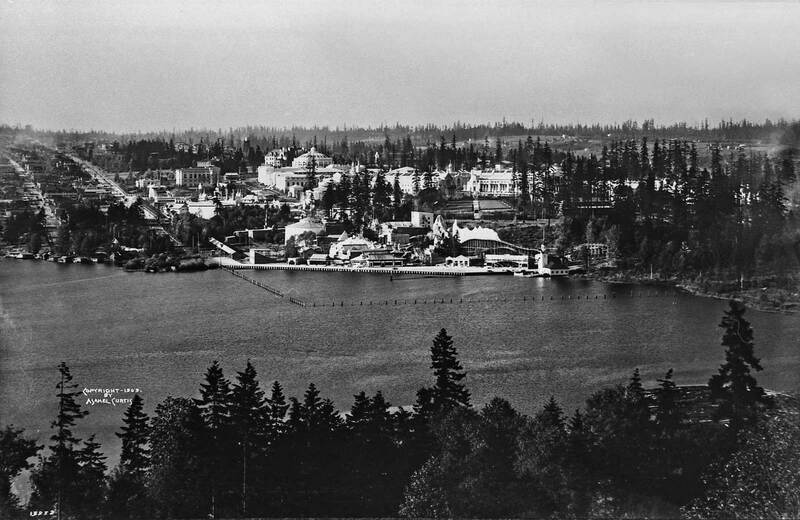 A few days more than one hundred years ago the Alaska Yukon and Pacific Exposition concluded its four-and-one-half-month run on a University of Washington Campus that was landscaped for it and arranged with sublime edifices in the classical style, most of them temporary plaster-on-wood creations, but splendid and convincing. 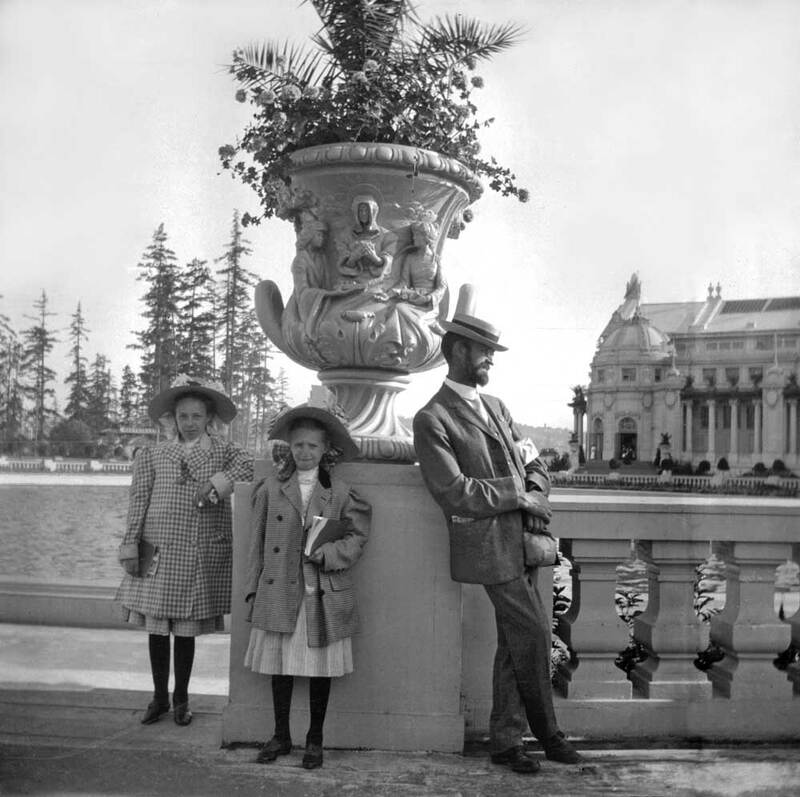 The state legislature agreed to help fund the AYP (for short) if at least three of the new buildings were made to stay put following the exposition for use by the school, which the politicians had long made a habit of neglecting. 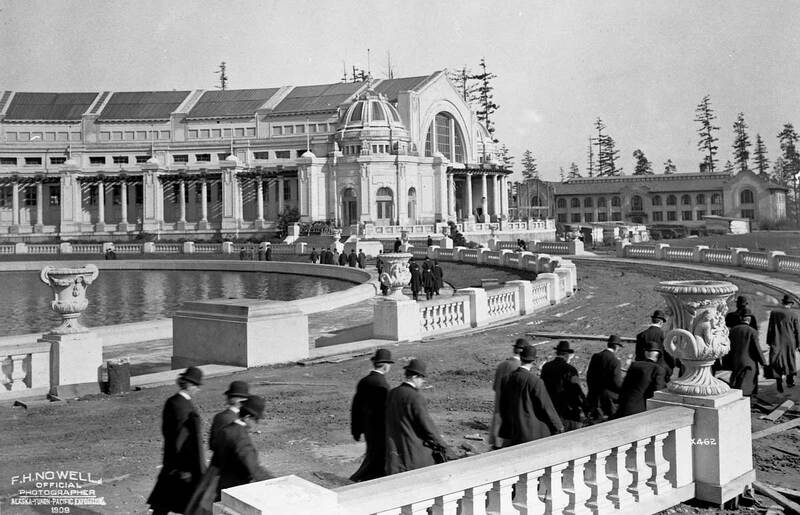 Throughout our recent summer – now in flight to California – Seattle has celebrated the memory of that “first worlds fair’ with elaborate exhibits, symposiums, special events, web pages, reenactments, and publications. (This centennial got considerably more attention than the city’s own sesquicentennial of a few years back.) Who could have expected a show of such wonderful energy and insight? You may have devoted your warm months to just tracking it all. If you missed it altogether, you must have stayed in the basement. 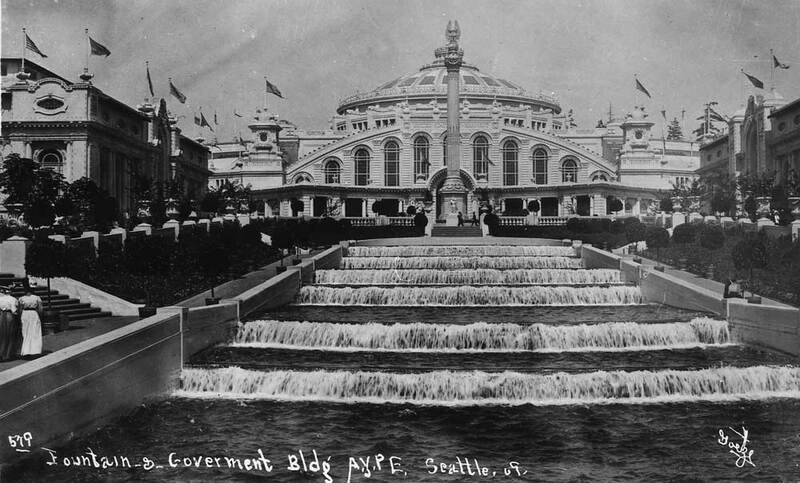 Seattle’s AYP was “motivated” more than inspired by Portland’s Lewis and Clark Centennial Exposition (LCCE), of 1905, part of which we see here. 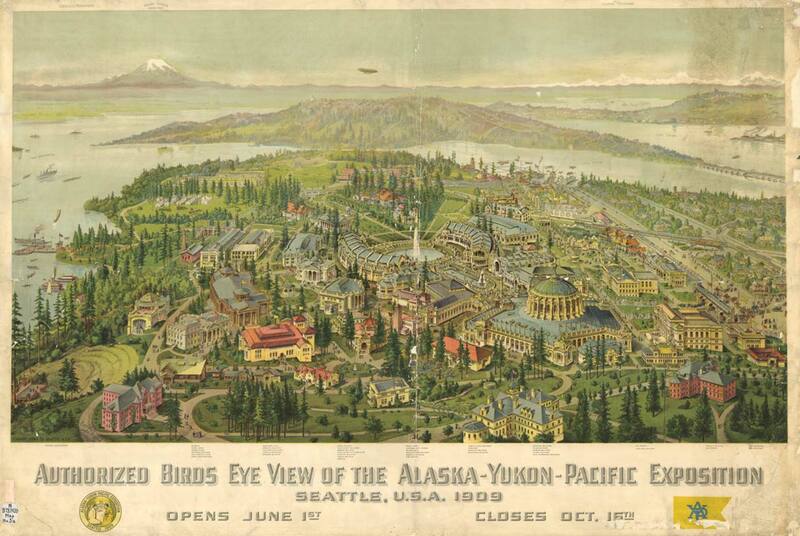 Godfrey Chelander, a Seattle exhibitor for his Arctic Brotherhood, returned to Seattle from the LCCE with the desire to make a permanent Alaska exhibit here. James A. 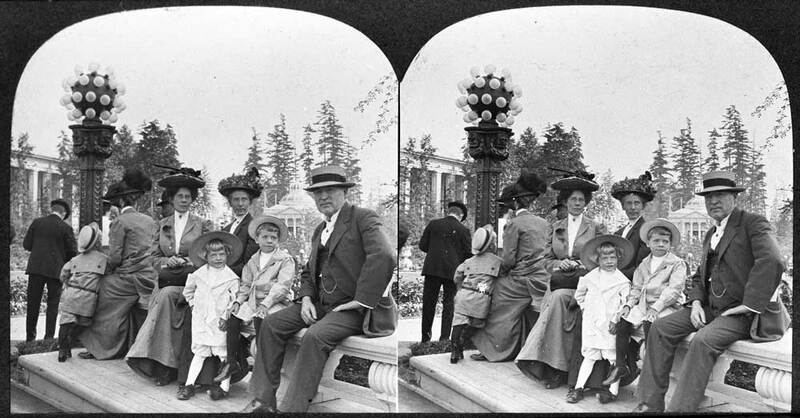 Woods, then city editor for The Seattle Times, turned the permanent exhibit into a summer-long worlds fair, partly as a way to show-up Seattle’s principal cultural and economic rival, Portland. And it did with rough statistics. AYP had more exhibits and with 3,770,000 visitors twice the gate. But could the AYP have been more sublime than this LCCE setting to the sides of Portland’s Guild’s Lake. 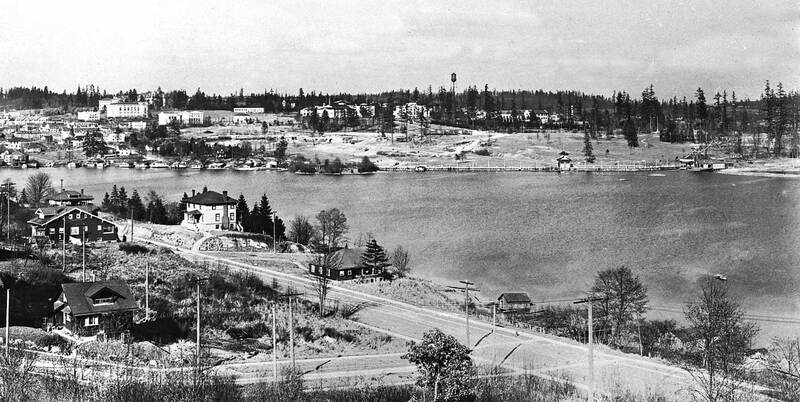 The site was conveniently near the business district, two trolley lines and the Willamette River and looked towards Mt. St. Helens, which was then still sublime on its own. And Guild Lake was manageable. In summertime it was but 2.5 feet deep. 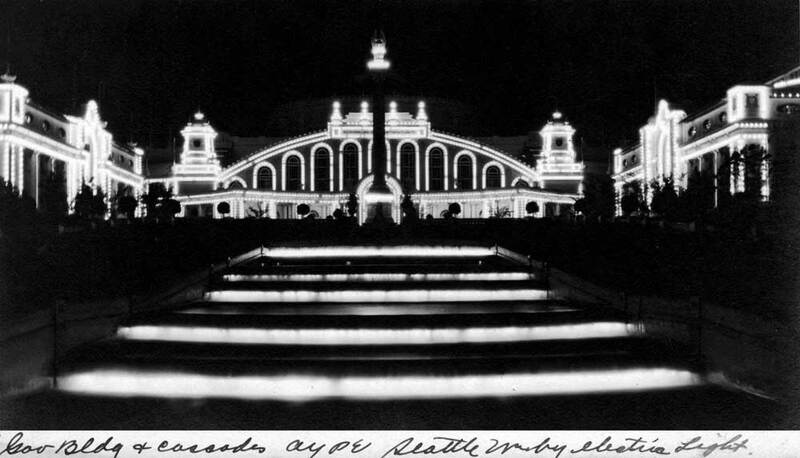 It required no extraordinary engineering to build the 1000 foot long Bridge of Nations, left of center, from the Expo’s main campus, mostly out-of-frame, to its US. Government Buildings beyond. 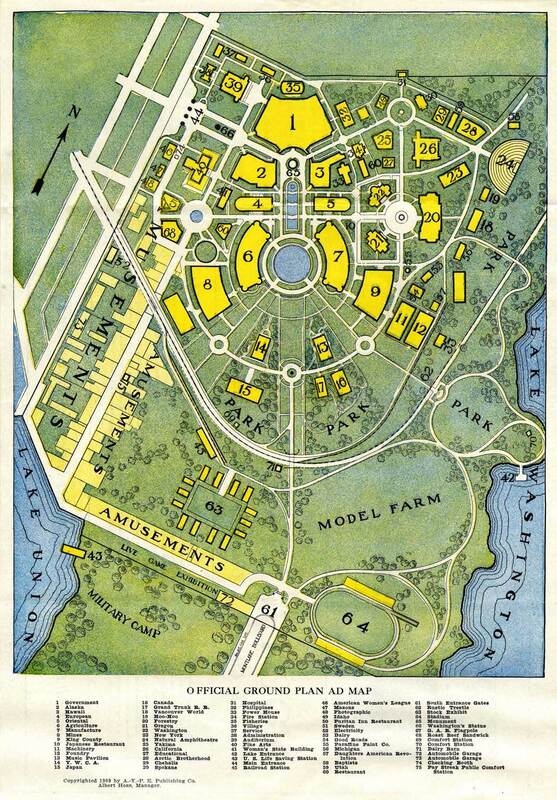 Quickly built, used and dismantled – except for those few “permanent buildings’” – the Expo, by some headine maker’s decree, became “Seattle’s forgotten worlds fair.” At least most of the structures and appointments were soon cleared from the campus. The exceptions were the few permanent buildings intended for school use following the fair. The juxtaposition below of the UW section from the 1912 Baist Real Estate Map and part of the AYP birdseye printed just above shows how drastic was the razing of AYP. But the inserted map is stingy. 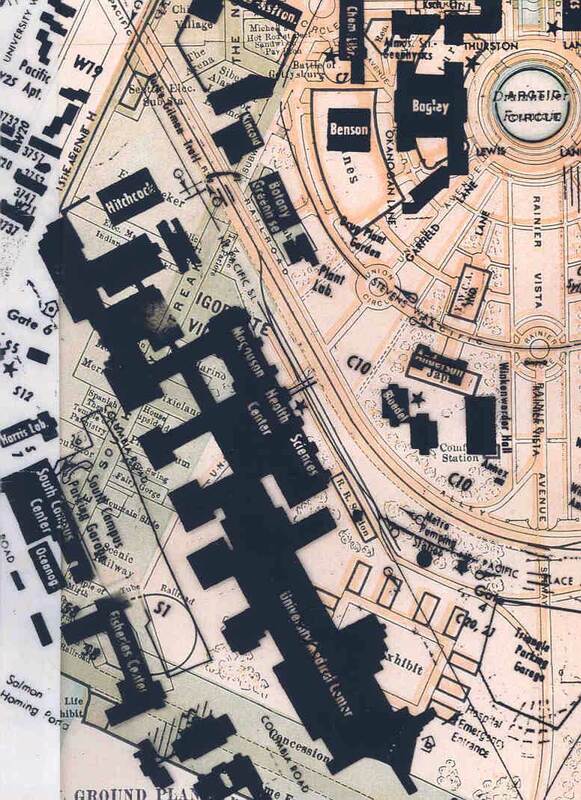 It shows in red the permanent campus brick facilities but also omits survivors from the fair, including the extremely wooded Forestry Building which hung around campus for many years after the fair serving at times both as a museum and as home for the school’s school of forestry. 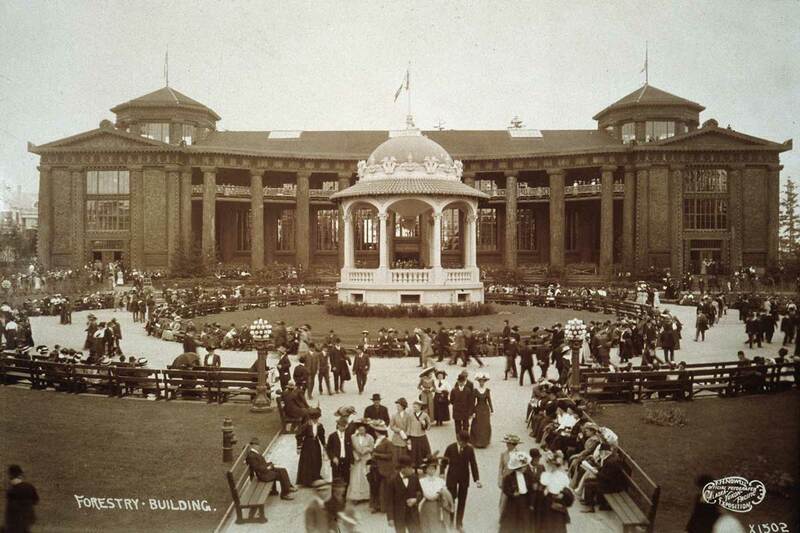 This “temple of timber” was, it seems, the most popular building at the fair. It is number 20 in the expo’s official map below. The reader may wish to try a game of referencing other numbered structures in the map to those appearing in the bird’s eye. In this the map is also good evidence for what is awry with the premature bird’s eye. Ron Edge here contributes another of his “clippings”. 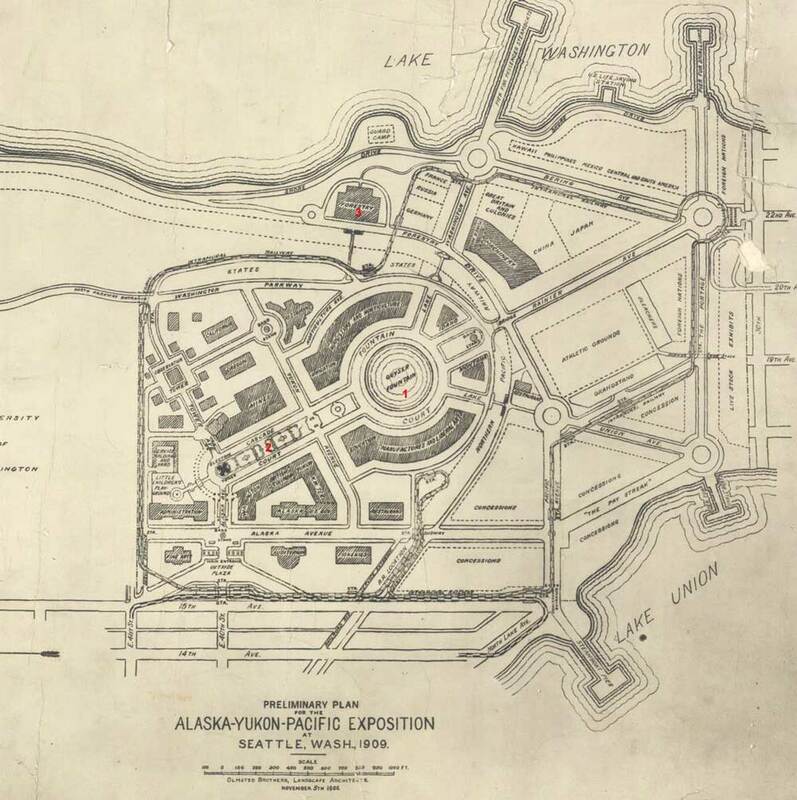 This one an earlier map of the Expo from 1906, which looks both familiar and strange. The Expo was also recorded from on high. Photographed from the Expo’s “captive air balloon” this aerial appeared on the front page of a local daily. It was an early use of an oversized half-tone and the captions told a half truth about how the pilot was lost in clouds until they opened to reveal the above. The clouds included at the top of this aerial are almost certainly a pre-photoshop invention. 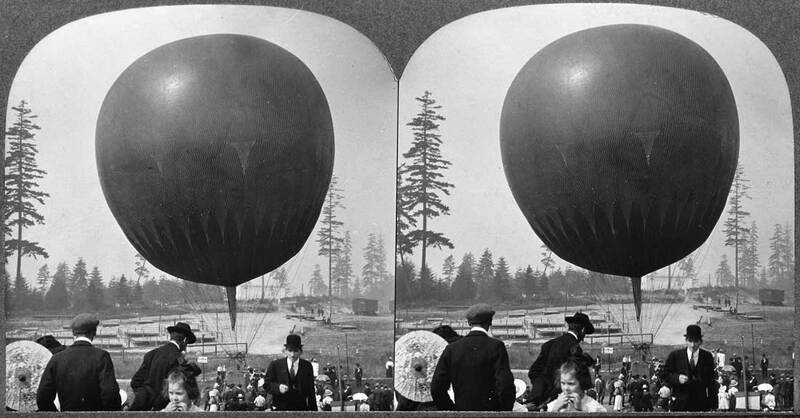 The balloon was also used to take one of the masterpieces of local historical photography, a panorama of about 180 degrees that, however, showed little of the fair but much the neighborhood including Union Bay, Madison Park, Capitol Hill, all of Portage Bay, and wrapping as far to the northwest as Latona and part of Wallingford beyond it. The panorama is not attributed. Original prints were part of a small archive of University District materials kept by a neighborhood bank. 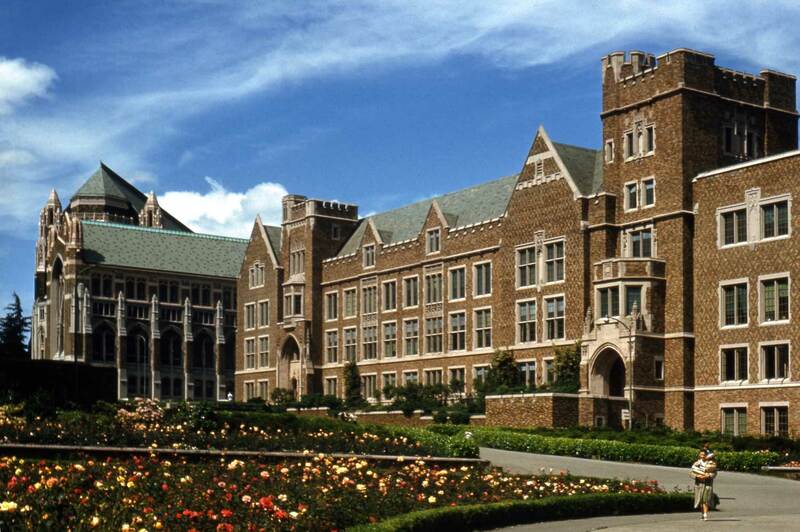 When it was sold to a California “financial institution” I helped persuade the last manager of the community bank to donate the collection to the Northwest Collection at the University of Washington. Somewhere there the five parts of this pan – here only crudely welded together and retouched – are kept in an archival folder waiting for someone to have high-resolution scans done from them with the intention of joining them together and giving this treasure the care and study is deserves. Two trolleys can be found on 40th Street heading for the fair, although portions of the Pay Streak seem unfinished suggesting that the pan was recorded some little time before the Expos opened. The balloon from which the above panorama was shot in five pieces shows in the pan below. It hovers over the end of the Pay Streak, the position it held to take the above pan. Stereo close-up of the photogapher's balloon. 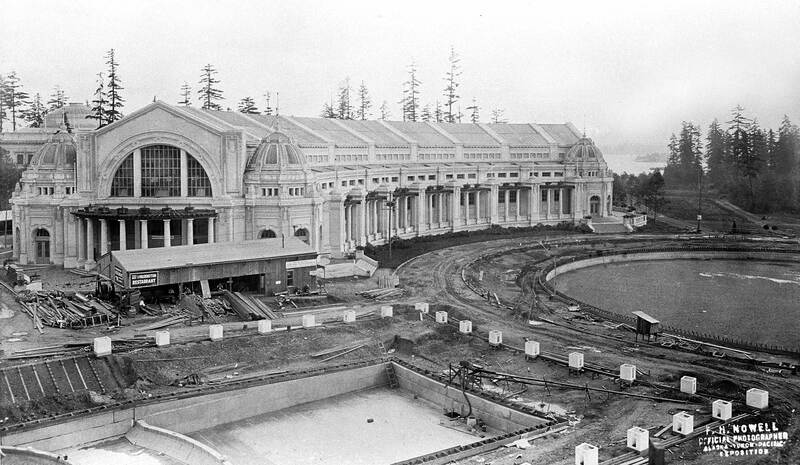 Next we will show a few more pans from Capitol Hill, the first from when construction expo construction was in its mid-stages. The future Pay Streak (the Carnival side of AYP) is merely a cleared path leading north from the photographs bottom right corner where the Portage Bay waterfront has been prepared with pilings for the many attractions that appear there in the balloon pan above. Meany Hall, one of the intended permanent buildings, shows left of center, and to the left of it is the AYP’s administration building. Another an much wider view of the Expo from Capitol Hill extends far to the west – as far as Seventh Avenue and just beyond it a portion of the low ridge that still rises west of the I-5 Freeway. The Avenues below, right to left, are Seventh, Eigth, Ninth, Roosevelt Way, 11th, 12th, Brooklyn, University Way and 15th Avenue. 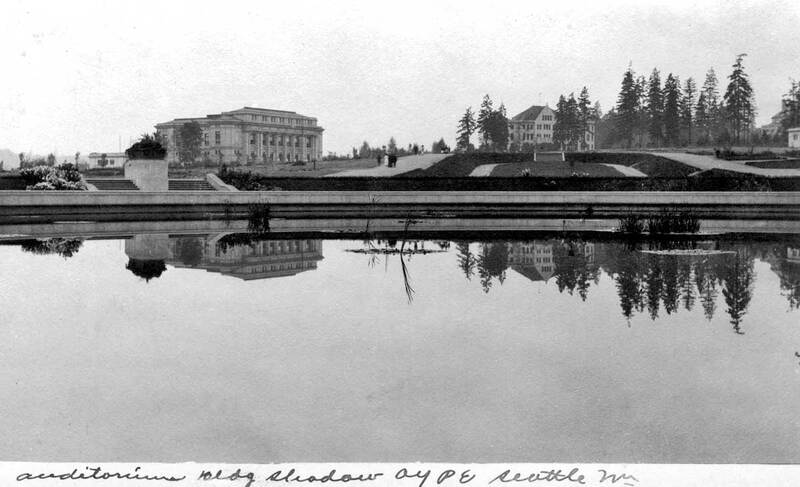 Follow now two more pans from Capitol Hill, the first by Asahel Curtis and the other from a few years after the fair – cira 1915 – when most the imposing structures that appear in the Curtis view and the others above it were remembered with pictures like these. 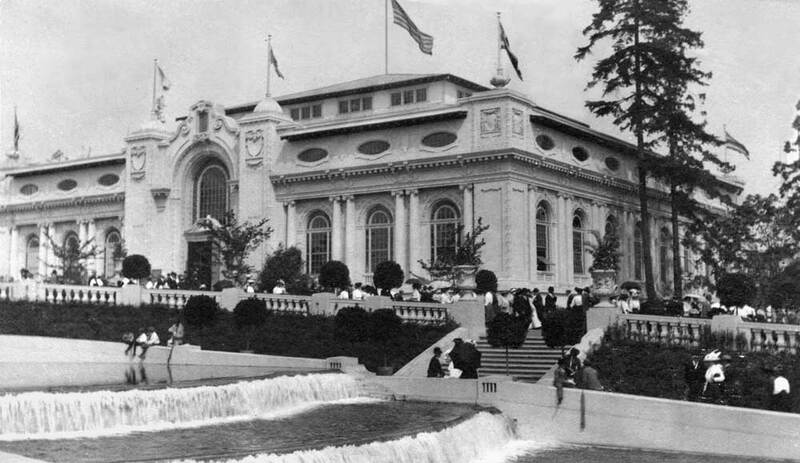 Now we will conclude with a few photographs of the Arctic Circle, which was the sublime Beaux Arts center of the fair. The Drumheller Fountain AKA Frosh Pond is a survivor of this grand hydraulics. 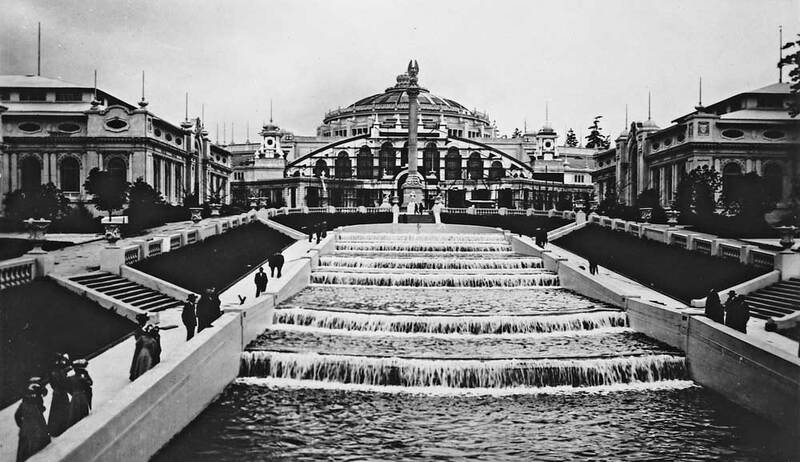 Now we sing a lullaby to the fair so that it may sleep better while waiting for its sesquicentennial in 2069, and the likelihood that again by then many will be clueless about “Seattle’s forgotten world’s fair”. A family - we think - at the fair. 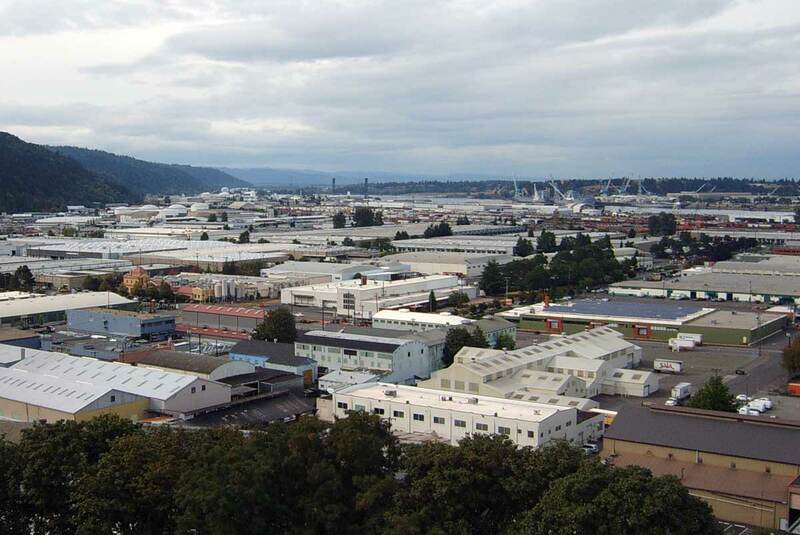 A construction scene looking across the Cascades to the Manufactures building. Sortect officials and VIPs inspect the fair during its late construction. The Manufacturers Building is beyond. The first of four unofficial photographs of the Cascades by photographers who were not allowed to use large format cameras. This snapshot is signed by Goetze. Oakes, one of the more prolific real photo postcard "artists", captured this view of the Cascades. The illuminated Cascades by Phillip Hughett, courtesy of Jim Westall. 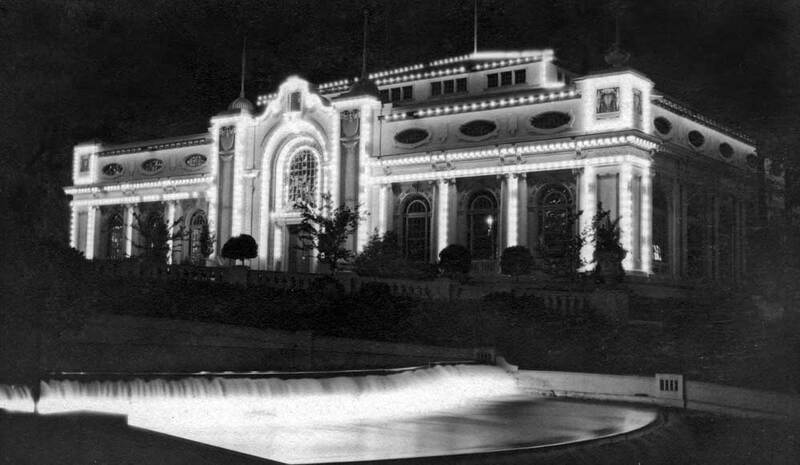 Next follows two photographs of the Hawaii Building both, like the illuminated Cascade directly above, recorded by Phillip Hughet. 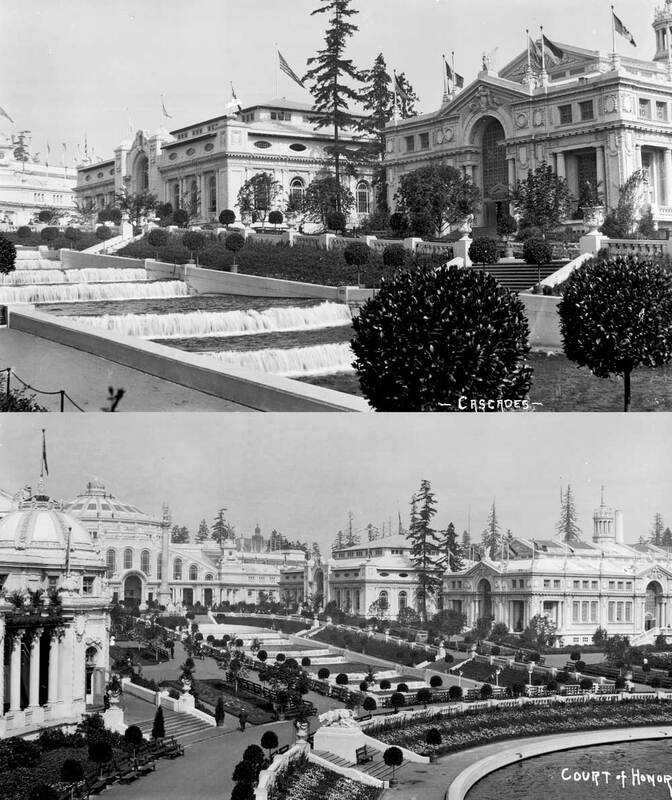 The Hawaii building was the next structure up the Cascades from the Manufacturers Building on the northeast side of the Cascades. Hawaii Building by electric light. Courtesy Jim Westall. Two by Price, a name long connected with photography. Price photo has for years operate customer services on Roosevelt in the same retail strip with Magnolia Hi. Fi. and the Sunlight Cafe, although much longer than either of them. Both these look towards, right to left, the Manufacturers Bldg, the Oriental Bldg, and the Hawaii Building. 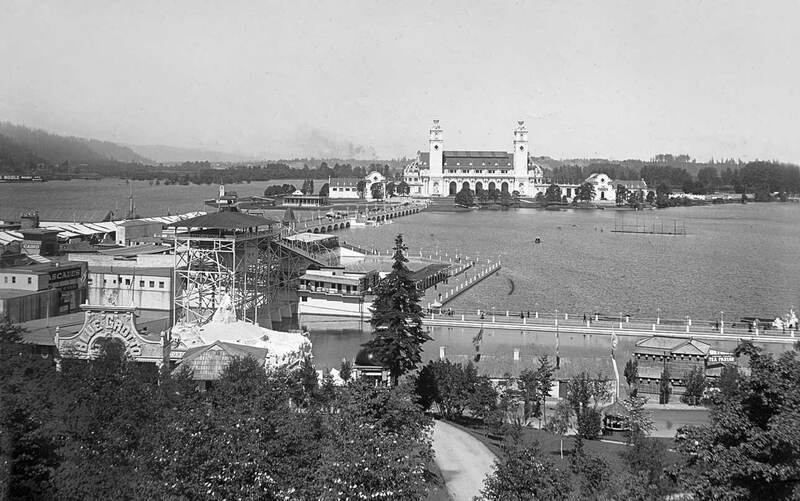 The next scene was recorded sometimes after the fair and most of its temporary structures are removed. Meany Hall appears on the left horizon, and the once cascading steps above the fountain are evident on the right. 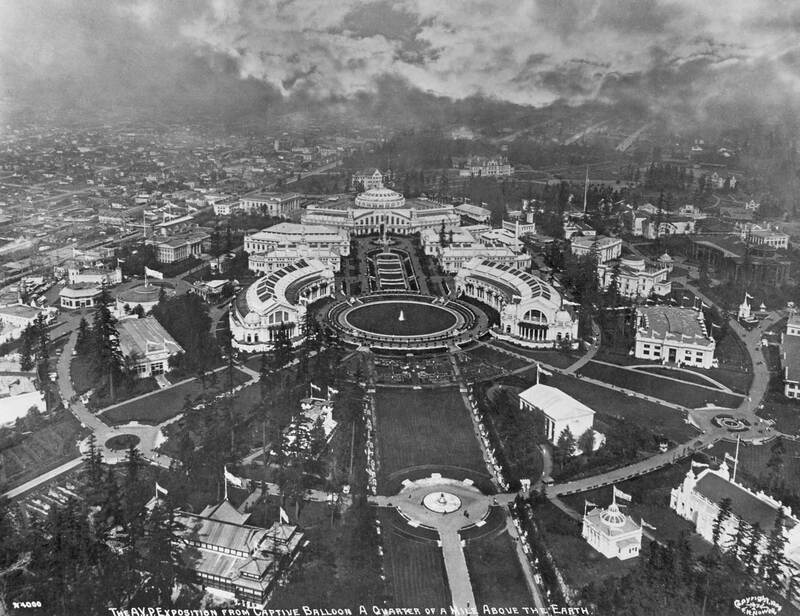 Right-of-center, Parrington Hall (built as Science Hall) appears, and unlike Meany Hall, which was weakened by an earthquake and removed, Parrington Hall survives. Contemporary U.W. Map superimposed on a fragment of the AYP Map. The Arctic Circle fountain, AKA Frosh Pond, appears upper right. The map was created by Dan Kerlee one of the real and devoted experts and collectors on AYP. Dan has had a busy year. Visit his AYPE.com web page. U.W. Physics Bldg, right, and part of the Suzzalo Library, left. The Physics building stands in part on the old footprints of both the AYP's Oriental and Hawaii Buildings. The roses here bloom where once the cascades fell. The photographer Robert Bradley date this June, 5, 1959. In Jean Sherrard’s and my book Washington Then and Now we featured the Arctic Circle with the “then and now” that follows. Finally – perhaps – a uncrowded scene to help us reflect on the AYPE for fifty years more. 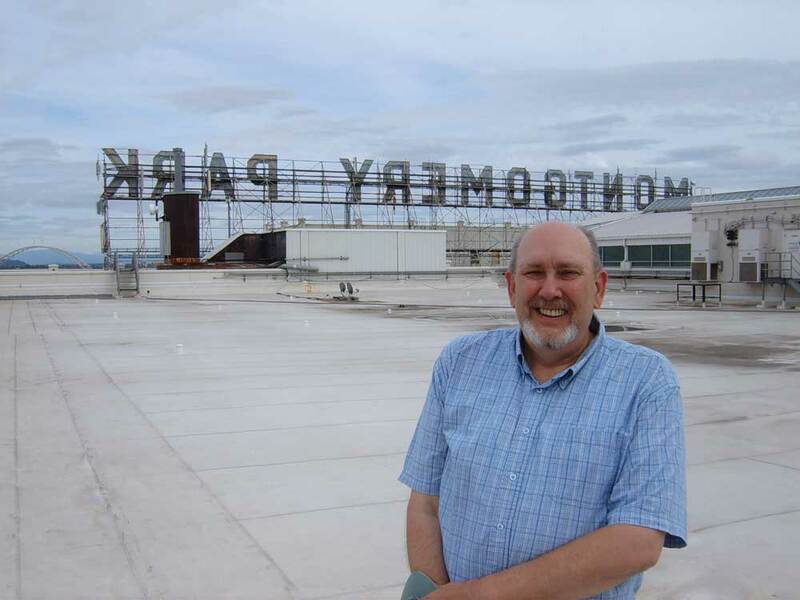 It is rare to catch such a cherished scholar-author as Portland’s Richard Engeman on the roof of a large Portland warehouse smiling. Richard explains the unique recreation of the jumbo sign behind him. “Did Claire or I send you a pic of the wonderful sign on the top of the Montgomery Park building? It was recycled from when it was the regional warehouse for Montgomery Ward–changing the sign meant changing only two letters.” Claire Sykes took the portrait. 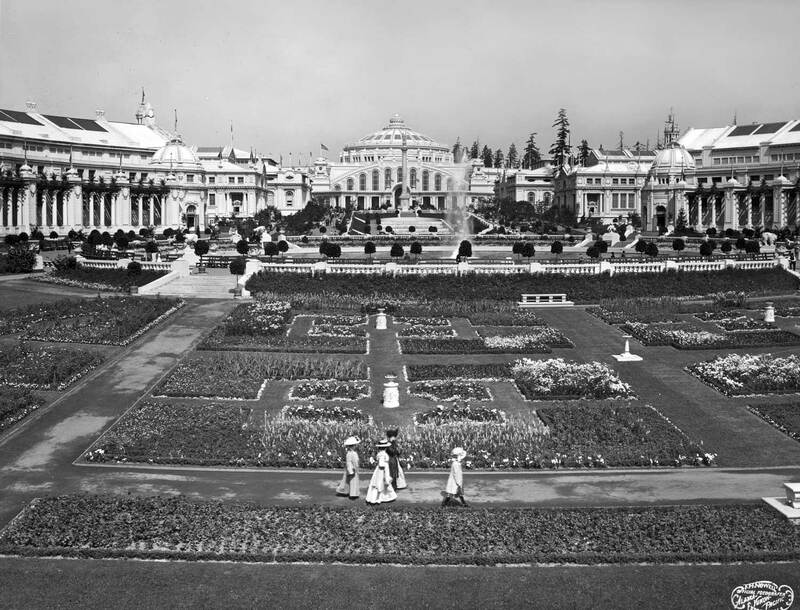 This, of course, is also the prospect from which Claire and Richard recorded the “now” repeat of this blog’s recent report on the 1905 Lewis and Clark Centennial Exposition campus. Very well done….parallels my life’s work in building new traditional work and honoring “the city”. Thank you, Duncan.